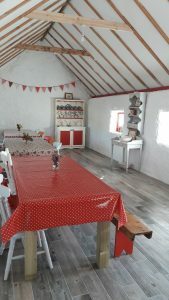 The Old Cottage – Indoor Communal Area. 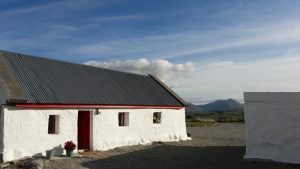 This old building which is steeped in history is the perfect place to unwind in the evenings. It has been recently renovated to act as an indoor communal area while still maintaining the charm of the old building. It is ideal for evenings when the weather is not suitable for a campfire. 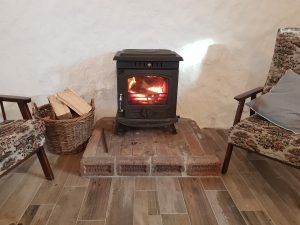 The Old Cottage is a large communal area with a wood burning stove and armchairs – just perfect for a cosy evening in by the fire with family and friends. 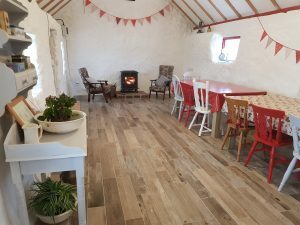 The area also has a large seating area with 3 large table, chairs and an old form (bench) so even if the weather is bad you can sit and eat indoors, play your favourite board games or enjoy a game of cards. This area is also ideal for large groups as they can all eat and socialise in the one area. There is electricity in this area, so you can enjoy listening to music on the speakers provided. There is also a fridge in this area for keeping your drinks chilled and near at hand!